I Didn’t LOVE ‘Em at the Start, But They’re SO good for You! I have to admit, I really didn’t like a radish in my food…in my salad, sandwich, as a garnish…I didn’t enjoy ’em at all. Then I learned about all of the benefits and I gave them anothershot. I gotta say they’re not that bad. I add them to my stir fry and I don’t even know they’re there. Check out below on why you should try too! The popular red globe radish is low in calories and can add in that little bit of “crunch” you’re looking for. Winter radishes such as daikons are similar in nutrients. Jaundice: Radish is good for the liver and the stomach and it is a detoxifies the blood as well. It is miraculously useful in jaundice as it helps removing bilirubin and also checks its production. It also checks destruction of red blood cells during jaundice by increasing supply of fresh oxygen in the blood. The black radish is more preferred in “treating” jaundice. The leaves of radish are also very useful in this cause. Piles: Radish is very rich in roughage, i.e. indigestible carbohydrates. This facilitates digestion, retains water, cures constipation (one of the main causes for piles) and thus gives relief of the condition. Being a very good detoxifier, it helps heal up piles fast. Its juice also soothes the digestive and excretory system and this also relieves piles. Urinary Disorders: Radishes are diurectic in nature, i.e. increase production of urine. The juice of radish also cures inflammation and burning feeling during urinating (just a benefit, not insinuating anything). 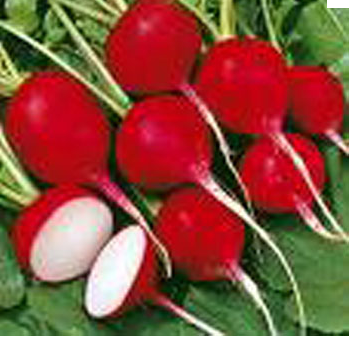 Radishes also cleans the kidneys and inhibits infections in kidneys and urinary system. Thus it helps a great deal in curing urinary disorders. Weight Loss: Radishes are low in digestible carbohydrates, high in roughage and contain a lot of water. Leucoderma: The detoxifying and anti carcinogenic properties of radish make it useful in treatment of Leucoderma. The radish seeds are used in this case. They should be powdered and soaked in vinegar or ginger juice or cows urine and then applied on the white patches. Eating radish also aids treatment of Leucoderma. Skin Disorders: Vitamin-C, phosphorus, zinc and some members of vitamin-B complex, which are present in radish, are good for skin. The water in it helps maintaining moisture in the body. Smashed raw radish is a very good cleanser and face pack. Due to its disinfectant properties, radish also helps cure skin disorders, such as drying up, rashes, cracks etc. and also refreshes it. Kidney Disorders: Being diurectic, cleanser and disinfectant, it helps cure many kidney disorders. Its diurectic properties help wash away the toxins accumulated in the kidneys. Cleansing properties clean kidneys up and lessens accumulation of toxins in the blood, decreasing their concentration in the kidneys. Its disinfectant properties aid in protecting the kidneys from any infection. Thus it is good for overall health of the kidneys. Fever: It brings down the body temperature and relieves inflammation due to fever. Drink radish juice mixed with black salt. Being a good disinfectant, it also fights infections which cause fever, thereby helping cure it. Respiratory Disorders, Bronchitis and Asthma: Radishes relieve congestion of respiratory system including nose, throat, wind-pipe and lungs, due to cold, infection, allergies and other causes. Liver & Gallbladder: Radish is especially beneficial for liver and gallbladder functions. It regulates production and flow of bile and bilirubin, acids, enzymes and removes excess bilirubin from the blood, being a good detoxifier. It also contains enzymes like myrosinase, diastase, amylase and esterase. It protects liver and gallbladder from infections and ulcers and soothes them. Other Benefits: Apart from above benefits, radish is a good appetizer, mouth and breathe freshener, laxative, regulates metabolism, improves blood circulation, is a good treatment for headache, acidity, constipation, nausea, obesity, sore throat, whooping cough, gastric problems, gallbladder stones, dyspepsia etc. This entry was posted in FIERCE HEALTH, FIERCE- ISH and tagged health, health benefits, nutrition, radish, weighloss, wellness by GETFIERCE TRAINING. Bookmark the permalink. Totally rad! I’m trying to like them too.